“He [Moses] gazed, and there was a bush all aflame, yet the bush was not consumed. (Exodus 3: 2)….God called to him out of the bush: ‘Moses! Moses!’ He answered, ‘Here I am.’ And He said, ‘Do not come closer; Remove your sandals from your feet, for the place on which you stand is holy ground. ‘I am’, He said, ‘the God of your father, the God of Abraham, the God of Isaac, and the God of Jacob.’ “(Exodus 3:4-6). God is always with us spiritually but there are few times when man is given the privilege of seeing the presence of God. These two Torah mantels depict two of those times. The first mantel is an abstract of the burning bush. The Hebrew letter y (shin) forms the foundation-branches of the bush with abstract leaves-flames surrounding the branches. Hand dyed cotton sateens were used to suggest the burning yet living bush. The Hebrew word for “I am,” the first word God says to Moses and the first word of the Ten Commandments, is hand embroidered with gold metallic threads in the top leaf-flame. “I am” is also quilted in other flames as if the essence of God is whirling around in the flames and then throughout the sky. 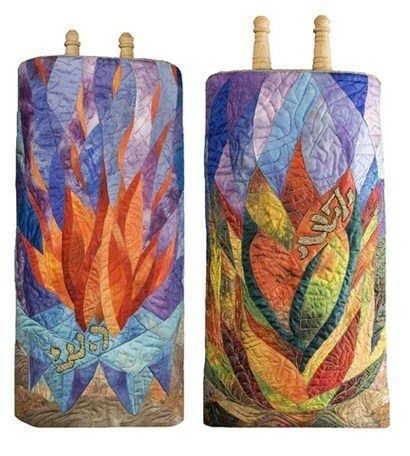 The second mantel visualizes the pillar of fire that rested above the tent of the Tabernacle when the Israelites were camped during the 40 years they wandered through the wilderness. “For over the Tabernacle a cloud of the Lord rested by day, and fire would appear in it by night, in the view of all the house of Israel throughout their journeys.” (Exodus 40:38) Embroidered in the man made tent is the Hebrew word for “Here I am,” man’s response to God. The Hebrew letters dance through the doors of the Tabernacle and are quilted throughout the sky as if man was singing them towards heaven. In the flames, “I am” is again quilted to show God’s presence.